The are two award programs: the Institute of American Cultures (IAC) Fellowships and Grants and the Asian American Studies Center (AASC) Grants, Fellowships, Scholarships and Academic Prizes. For more information, please contact AASC's IAC Coordinator, Melany De La Cruz-Viesca, at melanyd@ucla.edu. For more information on the Sakaguchi Graduate Internship, please click here. For more information on the Fong and Toy Family Internship in Chinese American Studies, please click here. Awards range from $8,000 to $500. They are provided from endowments and special funds that were established through the generosity of donors to the UCLA Asian American Studies Center. Grants, Fellowships, Academic Prizes, and Scholarships are given for community oriented research, creative projects, campus or community service experience, internship with specified community organizations. For Grants, Fellowships and, Scholarships, the applicant must be a registered continuing graduate or undergraduate student enrolled at UCLA in the upcoming academic year from July to June for Fall, Winter, Spring quarters, and Summer sessions if applicable. For Prizes, any student can apply including students who are graduating or completing their degree programs. Students can submit a paper, thesis or dissertation for consideration. For Prizes, students who are graduating or completing their degree programs can submit a paper, thesis or dissertation. Applicant can be enrolled in any departmental major or graduate program at UCLA. Applicant can be of any race or ethnicity and academic discipline at UCLA, for most fellowships, scholarships, internships and grants. Additional eligibility or criteria requirements for specific fellowships, prizes and grant may be listed. IMPORTANT: Submit one application with your curriculum vitae and proposal(s) or paper(s) as a Microsoft Word document and PDF of your academic transcript to scp@aasc.ucla.edu, in the email subject heading, please enter: 2019 Application for Fellowship/Scholarship/Internship/Grant/Academic Prize (as appropriate). For complete information, please read through the Guidelines. Eligibility: Continuing graduate or professional school students who are in the Asian American Studies MA, Graduate Concentration and/or who are enrolled in AAS classes are preferred. Student will be funded for an internship with the UCLA Asian American Studies Center for 2 quarters during Summer/Fall, Fall/Winter or Winter/Spring. Internship hours may vary based on award amount. Student will work with faculty and/or staff on a special project or program. Criteria: Academic record, application and personal essay must reflect student's interest in the field of Asian American and Pacific Island Studies. Essay: Describe your interest and/or experience with the Asian American Studies Center and/or with the field of Asian American and Pacific Island Studies. Essays can be 5 pages maximum. Eligibility: Must be a continuing graduate or professional student enrolled at UCLA from the People's Republic of China. Fellowship recipients will be funded for research or creative project on a significant topic dealing with the Asian Pacific American experience. + include any conference presentation and/or publication plans. Limit your proposal to five double-spaced pages. Faculty Recommendation form on page 3 of application must be submitted. Criteria: Academic record, application and proposal must reflect student's interest in social issue-oriented research regarding the Asian Pacific American community. Criteria: Academic record, application and proposal must reflect student's interest in research on Asian Pacific American women. Criteria: Academic record, application and proposal must reflect student's interest in community-oriented research in the Asian Pacific American community of Southern California. Eligibility: Continuing graduate or professional students at UCLA of Japanese ancestry. Fellowship recipients will be funded for research or creative project on a significant topic dealing with the Japanese American experience. Eligibility: Continuing Japanese national graduate or professional student enrolled at UCLA. 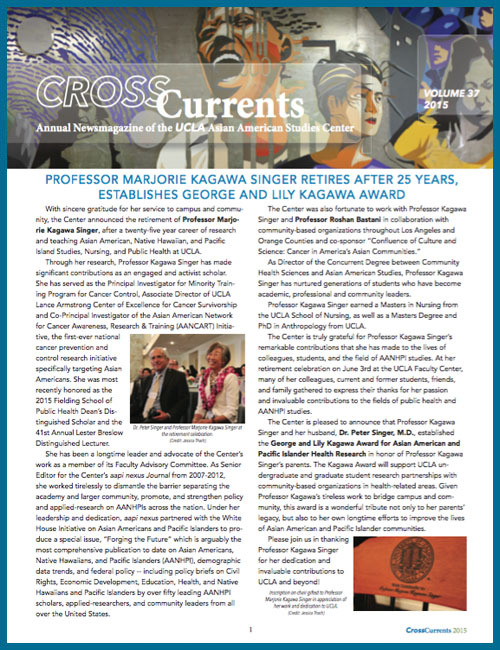 Fellowship recipients will be funded for research or creative project on a significant topic dealing with the Japanese American experience. Criteria: Academic record and most outstanding graduate paper on a topic related to the lessons learned from the World War II internment of Japanese Americans. Papers can be submitted that have been written for any academic course or be new papers. Papers should be 20 to 30 pages. Criteria: Academic record and most outstanding graduate paper relating to Asian Pacific Americans and social issues they face. Papers can be submitted that have been written for any academic course or be new papers. Papers should be 20 to 30 pages. Criteria: Academic record and most outstanding graduate paper on Asian Pacific American history and/or experience. Papers can be submitted that have been written for any academic course or be new papers. Papers should be 20 to 30 pages. Criteria: Academic record, outstanding graduate paper on Asian Pacific American literature, arts and culture. Papers can be written for any academic course or be new papers. Papers should be 20 to 30 pages. Eligibility: Application must reflect student's interest in Asian Pacific American studies and/or Women's studies. 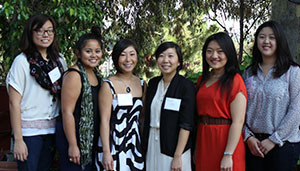 Criteria: Academic record and most outstanding graduate paper, thesis or dissertation on Asian Pacific American women. Students can submit papers written for any academic course, can be a new paper, thesis or dissertation. Papers can be 20 to 30 pages. Criteria: Academic record and most outstanding graduate essay or research paper on Chinese immigrants whether in the United States or other countries outside of China, can be focused on a a historical or contemporary topic. Papers can be written for any academic course or be new papers. Papers should be 20 to 30 pages. Eligibility: Must be a continuing undergraduate student enrolled at UCLA for the current and upcoming academic years. Provide evidence of academic record. Students can get an unofficial (or student copy) transcript may be obtained online through MyUCLA. The unofficial transcript can be viewed on-screen or printed as a PDF. There is no charge for an unofficial transcript. Read essay guidelines below. Submit a resume. If you do not have one see guidelines on application. Students in any academic department degree program can apply. Criteria: Applicant must have a disability. Essay: Describe your background, what your disability is, how you will achieve your educational goals and future plans. Essay should be no more than 500 words maximum. Eligibility: Continuing undergraduate students who are enrolled in the Asian American Studies Bachelor of Arts or Minor program, and/or who are enrolled in AAS classes preferred. Student will be funded for an internship with the UCLA Asian American Studies Center for 2 quarters during Summer/Fall, Fall/Winter, or Winter/Spring. Student will intern for 8 hours a week for 10 weeks during the quarter working with faculty and/or staff on a special project or program. Criteria: Academic record, application and personal essay must reflect student's interest in the field of Asian American and/or Pacific Island Studies. Essay: Describe your interest and/or experience with the Asian American Studies Center and/or with the field of Asian American and Pacific Island Studies. Essay can be 5 pages maximum. Eligibility: Campus or community service experience and financial need. Essay: In your experience, how does community service, on and off campus, enhance your university education? Essay can be 5 pages maximum. 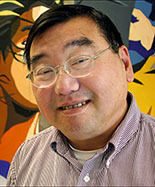 Criteria: Academic record, undergraduate paper on Japanese American history and/or experience. Papers can be written for any academic course or may be new papers. Eligibility: Application and paper must reflect student's interest in Japanese American and/or Japanese Studies, which may include history, literature, arts, politics, economics, culture, language, media, health and society. Criteria: Financial need, undergraduate paper on Japanese American or Japanese studies. Essay: Papers can be written for any academic course or may be new papers. Eligibility: Continuing undergraduate students of Japanese ancestry. Criteria: Academic record, commitment to service and financial need. Essay: The Japanese American experience has many lessons to offer to people of all backgrounds in this country. What do you consider to be the most important lesson that should be shared with American society? Why? Award: 1 internship stipend, for a ten week summer internship at 20 hours a week or a twenty week internship at 10 hours a week over two quarters. Eligibility: Continuing undergraduate students of Japanese ancestry. Student will be funded for a proposed internship with one of the following Japanese American community-based organizations: Japanese American National Museum (www.janm.org); Keiro Services (www.keiro.org); Little Tokyo Service Center (www.ltsc.org). The internship can be scheduled during Summer for about 20 hours per week over 10 weeks or during the regular academic session for 2 quarters, Summer & Fall, Fall & Winter, Winter & Spring, for about 10 hours per week. Students interested in public health, social welfare, gerontology, psychology, art history, and museum studies are encouraged to apply. Essay: Describe your background, interest, and/or experience in working with senior citizens in a social service agency or a museum, especially one dedicated to Japanese Americans. Please indicate if you are bilingual and/or bicultural. Essay can be 5 pages maximum. Eligibility: Continuing undergraduate students of Japanese ancestry. Grant will subsidize a project on research, creative endeavor, or community service in an area related to the Japanese American experience. Criteria: Academic record and relevance and impact of research proposal. Essay: Describe your project, including its key goals and objectives and how it will be accomplished (e.g. plans, procedures, methodology, etc.). + Explain how it will contribute to Japanese American Studies and/or the Japanese American community. + Also provide a budget detailing expenses (travel, supplies, etc.). Submit Faculty Recommendation form on application page 3. Criteria: Academic record and most outstanding undergraduate paper on a topic related to the lessons learned from the World War II internment of Japanese Americans. Papers can be submitted that have been written for any academic course or may be new papers. Essay: Papers should be 10 to 15 pages. Criteria: Academic record and most outstanding undergraduate paper relating to Asian Pacific Americans in the context of Race Relations. Essay: Papers can be submitted that have been written for any academic course or may be new papers. Papers should be 10 to 15 pages. Criteria: Academic record and most outstanding undergraduate paper on Asian Pacific American history and/or experience. Essay: Papers can be written for any academic course or may be new papers. Papers should be 10 to 15 pages. Criteria: Academic record, outstanding undergraduate paper about Asian Pacific American literature, arts, and culture. Criteria: Academic record and most outstanding undergraduate paper on Asian Pacific American women. Scholarship Resource Center, 233 Covel Commons, 310-206-2875 or online here.